Kolkata, Aug 26 (IBNS): The Archbishop of Kolkata, Reverend Thomas D’Souza along with Namit Bajoria, the Honorary Consul of the Republic of Macedonia, Subrata Ganguly of Church Art, Father Dominic Gomes and others paid floral tributes and prayers at the life-sized bronze statue of Mother Teresa at the Archbishop House on Sunday to observe the 108th Birth Anniversary of St Teresa. The bronze statue of St Teresa, designed by Church Art, was donated by Namit Bajoria in 2016 to mark a symbolic link between Kolkata and Skopje, Macedonia’s capital city where Mother was born. A cake was also cut by the Archbishop Thomas D’Souza who shares his birthday with Mother Teresa. Mother Teresa, known in the Roman Catholic Church as Saint Teresa of Calcutta was an Albanian-Indian Roman Catholic nun and missionary. She was born in Skopje (now the capital of Macedonia), then part of the Kosovo Vilayet of the Ottoman Empire. After living in Macedonia for eighteen years she moved to Ireland and then to India, where she lived for most of her life. Teresa received a number of honours, including the 1962 Ramon Magsaysay Peace Prize and 1979 Nobel Peace Prize. She was canonised (recognised by the church as a saint) on 4 September 2016, and the anniversary of her death (5 September) is her feast day. She died on September 5, 1997, less than a month after her 86th birthday. (Image Credit: Twitter) Special masses and prayer sessions were held in the city today on the occasion of Mother Teresa's 108th birth anniversary. At the Mother House, the global headquarters of Missionaries of Charity, nuns and shelter home inmates, along with the general public, lit candles and offered prayers to the patron saint of Kolkata this morning. 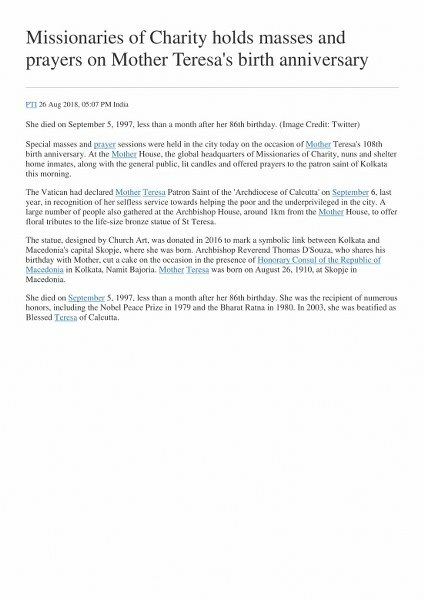 The Vatican had declared Mother Teresa Patron Saint of the 'Archdiocese of Calcutta' on September 6, last year, in recognition of her selfless service towards helping the poor and the underprivileged in the city. A large number of people also gathered at the Archbishop House, around 1km from the Mother House, to offer floral tributes to the life-size bronze statue of St Teresa. The statue, designed by Church Art, was donated in 2016 to mark a symbolic link between Kolkata and Macedonia's capital Skopje, where she was born. Archbishop Reverend Thomas D'Souza, who shares his birthday with Mother, cut a cake on the occasion in the presence of Honorary Consul of the Republic of Macedonia in Kolkata, Namit Bajoria. Mother Teresa was born on August 26, 1910, at Skopje in Macedonia. She died on September 5, 1997, less than a month after her 86th birthday. She was the recipient of numerous honors, including the Nobel Peace Prize in 1979 and the Bharat Ratna in 1980. In 2003, she was beatified as Blessed Teresa of Calcutta. A large number of people gathered at the Archbishop House, around 1km from the Mother House, to offer floral tributes to a life-size bronze statue of Saint Teresa. Kolkata: Special masses and prayer sessions were held in the city on Sunday on the occasion of Mother Teresa's 108th birth anniversary. 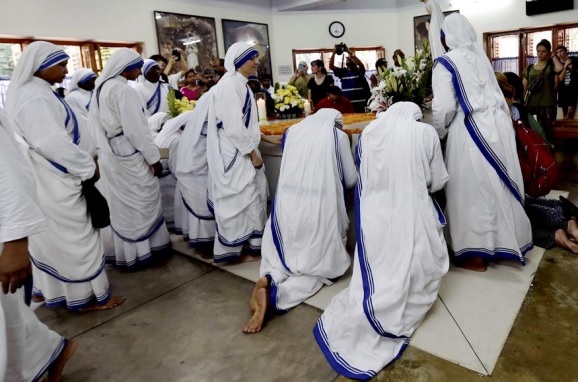 At the Mother House, the global headquarters of Missionaries of Charity (MoC), nuns and shelter home inmates, along with general public, lit candles and offered prayers to the patron saint of Kolkata on Sunday morning. The Vatican had declared Mother Teresa 'Patron Saint' of the 'Archdiocese of Calcutta' on September 6, last year, in recognition of her selfless service towards helping the poor and the underprivileged in the city. The honour came a year after Pope Francis had proclaimed her 'Saint' at a canonization mass. Sunita Kumar, a spokesperson of MoC, urged people to follow Mother's ideals in everyday life. "She will forever live in our hearts... We should all take a pledge to follow her path and work for the poor and the helpless," Kumar told PTI. A large number of people also gathered at the Archbishop House, around 1km from the Mother House, to offer floral tributes to a life-size bronze statue of Saint Teresa. The statue, designed by Church Art, was donated in 2016 to mark a symbolic link between Kolkata and Macedonia's capital Skopje, where she was born. Archbishop Reverend Thomas D'Souza, who shares his birthday with Mother, cut a cake on the occasion in the presence of Honorary Consul of the Republic of Macedonia in Kolkata, Namit Bajoria. Mother Teresa was born on August 26, 1910 at Skopje. She died on September 5, 1997, less than a month after her 86th birthday. She was the recipient of numerous honours, including the Nobel Peace Prize in 1979 and the Bharat Ratna in 1980. In 2003, she was beatified as 'Blessed Teresa of Calcutta'. he altar is in the shape of a dhol, the tabernacle is a kola. The man behind this is Subrata Ganguly whose Kolkatabased Church Art a unit of Lokenath En-gineering, has been involved in var-ious works of restoration, renovation, designing and decor of churches across almost all the states in India for over two decades. The magnificent church glitter-the Cross ing white in the hot sun in the midst of Santhali villages in Jharkhand was inaugurated at a huge celebration recently by Father Varghese Puthussery SJ, provincial of Duma-Raiganj province in the presence of His Grace Bishop of Dumka Rev Julius Marandi, His Grace Bishop of Asansol Cyprian Monis and the parish priest Father Thomas Susai among other dignitaries. A mechanical engineer by profession, Ganguly has been involved in church work since his school days. A student of Don Bosco Liluah he completed his studies in Bombay and Delhi. Way back in the mid-80s, he was commissioned to do tribal research for a museum in Shillong. He also manufactured special diesel ovens for the church and seminary to combat the gas shortage there around the same time. This got him involved in church decor and restoration work. <p>Ganguly's entire family is involved in the business. With 30 workers working directly under him, 50 are indirectly involved which include the researchers, professors, anthropologists, etc- "We have worked-for all Catholic con-gregations and Catholic dioceses in India. It is our endeavour to create awareness in public regarding new concepts in the interior designing and decoration on conventional products used in designing and fabricating the sanctuary section, altars, podium, pulpit, statues, relief murals, stained glasses, chairs, pews, lighting and sound system, etc in churches" Ganguly said. Church Art has executed prestigious projects for some of the famous churches in Goa, Mumbai, Chennai, Shillong, Ra-jasthan, Madhya Pradesh, north-eastern states and other places. Extensive research work, engineering and manufacturing technology and software tools are used to provide innovative products and concepts for setting up these unique churches. Ganguly is very satisfied with the work he has been doing all these years and looks forward to more such projects where he can "create a beautiful atmosphere for prayer, love and friendship". At present he is busy doing the research work for his next project, a new church in Rajasthan, Ambapara. Burdwan: December 21 was a red-letter day for the people of Burdwan. 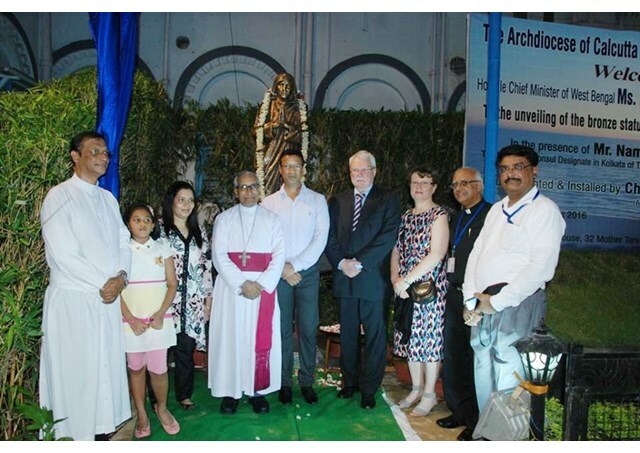 The town saw the inauguration and dedication ceremony of the newly built Sacred Heart Church at Tentultala. The church is one of the first churches in the state to have architecture and interior designs based on local cultural themes. The church which was registered as a chapel in August 1868 with the help of the Maharaja of Burdwan for the British soldiers, was broken down and rebinding started around two years ago. For the interiors the conventional European mode was changed to the local Indian mode where the interior decor and paintings reflect Biblical parish themes by incorporating local cutural elements like palki, shades of Mughal architecture and glass paintings in the Indian art style. This is one of the first inculturation initiatives in West Bengal by the Catholic church. The altar slab of the original chapel has been retained in the reconstructed church. Kolkata based Church Art, has done the design work for this project. Church Art has been involved in various works of restoration, renovation, designing and decor of churches across almost all states in India for over two decades. Tiruchi: The newly constructed cathedral of Tiruchi, Tamil Nadu, has made history with the execution of a huge relief depicting Jesus at prayer. The mural, approximately 75 feet in width and 23 feet in height, is fixed on the wall above the choir-loft in the balcony inside the church, over the main entrance of the cathedral. “It is one of the biggest reliefs in church art executed anywhere in India,” says Kolkata-based Director of Church Art Subrata Ganguly who supervised the giant piece of art. The scene is of Jesus at prayer – “Very early in the morning, while it was still dark, Jesus got up, left the house and went off to a solitary place, where he prayed” (Mark 1:35). “The time depicted is of dawn, so lot of light and shadow effect is shown in the work with minute details of Jesus figure and of the landscape. The rocks are projected very clearly. The overall finish style is realistic with high relief work of 18 to 20 inches projecting out of the base finished in multicolor shows the tonal color effect of the time of the day,” Ganguly explains. Built at a cost of 130 million rupees since August 2011, the new cathedral was consecrated on May 3 at a massive ceremony presided over by Archbishop George Antonysamy of Chennai along with Bishop Antony Devotta of Tiruchi and a huge gathering of dignitaries and faithful. The cathedral is dedicated to Our Mother of Good Health – popularly called Arockia Annai by the local people. Ganguly runs Church Art, a firm that designs new churches and renovates existing ones to give them a strong local flavor. “We have worked in all states and almost 170 dioceses in the country,” Ganguly says proudly. “In the case of new churches, we formalize a concept after intensive discussions with the local diocese or religious congregation, and then work with a local architect to give the concept a concrete shape on the drawing board. Next, we work with the contractor to ensure proper construction. After that, we start working on the interiors and various other objects like the pulpit, the altar, murals, windows and various other objects,” Ganguly says detailing the procedure he follows. “With old or existing churches, too, we follow a similar routine. All the moveable ‘inculturated’ objects, including murals and statues, are made at my workshop in Kolkata and transported to the respective sites. Big objects like giant or large size statues are transported in knocked-down form and then reassembled at the site,” Ganguly adds. “The requirements for an inculturated church or seminary in Northeast India are very different from those at Ambapara in Rajasthan’s Udaipur,” explains Ganguly citing examples of his work. At Ambapara, Jesus is portrayed as a Bhil tribal after our team studied and researched extensively on the Bhils. We always do this before every such project, to get an accurate idea of local customs, traditions and culture,” Ganguly adds. Other remarkable specimens of Ganguly’s studio creations installed around the country include Jesus sitting cross-legged on a lotus (installed in a church in Hyderabad), or Jesus emerging after a purifying bath in the Ganges with temples on the riverbanks (in a mural in a Haridwar church), or rendered as a typical Bastar tribal priest surrounded by tribal women at a church at Bhopal. At a church in Jhansi, scenes from Christ’s life are presented in a set of 40 paintings which has human and animal characters that leap straight out of Amar Chitra Katha and Panchatantra comics. “We’ve installed similar panels in many churches and the feedback has been very good. We’re getting requests to make more such panels and murals, which show biblical characters in Indian forms, from various churches, seminaries and Christian institutions all across the country,” says Ganguly. Church Art is a unit of Lokenath Engineering, Kolkata, engaged in designing, manufacturing various items required in churches and place of worship under patronage, guidance, love and support of different archbishops, bishops, priests and nuns from all over India and abroad. ·The Indian crib set is the representative of a pan-Indian culture, said Fr. ·Jesudoss Arokiam, Bursar of the Museum, adding that it is a matter of great honour and prestige that an Indian crib set, which was long due, will now find a place among other crib sets stationed in the International Nativity Museum in Bethlehem. ·Officials of the museum said that the demand for an Indian crib had been there for quite some time. ·The Indian crib is made by a Kolkata-based company Church Art, which provides creative art works for churches, schools and museum. 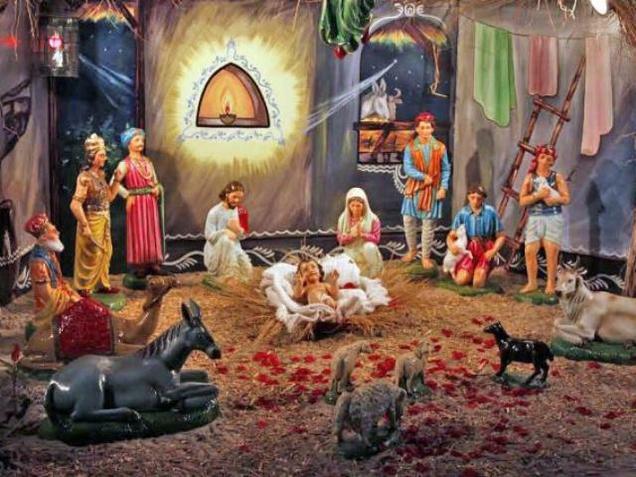 A crib from India has for the first time found a place at the UNESCO-promoted International Nativity Museum located in Bethlehem. The museum, which draws visitors from across the globe, contains more than 223-nativity representations of crib sets from over 90 countries. The unique aspect of the museum is that each crib depicts the birth of Christ using the styles and motifs unique to the tradition and culture of the country it comes from. Officials of the museum said that the demand for an Indian crib had been there for quite some time. In fact in 2013, the highest number of tourists visiting the museum in Bethlehem was from India. The Indian crib is made by a Kolkata-based company Church Art, which provides creative art works for churches, schools and museum. With a village backdrop, the Indian crib set uses traditional dresses like saris and dhotis and the facial features have been done on the lines of the models created by village artisans. The model, which also includes a cow and a camel, is made of fibreglass while sets from other parts of the world have been made of stone, ceramics, wood or clay. “We tried to display a complete Indian setting through the crib set. The three kings or the magi, have been attired in the royal traditions. So we have a Chola king from the South, a Rajput king from the North, and a king from Assam to represent the East,” Subrata Ganguly, director of Church Art, told The Hindu. Mr. Ganguly said officials from the International Nativity Museum had come to the city last month to collect the crib set. Legend has it that the place where the International Nativity Museum stands today, was the same spot the three wise men passed through on their way to meet the Infant Jesus more than 2,000 years ago. The museum was first started at Turin in Italy but was shifted to Bethlehem, the birthplace of Jesus, in 1999. “We tried to display a complete Indian setting through the crib set. The three kings or the magi, have been attired in the royal traditions. So we have a Chola king from the South, a Rajput king from the North, and a king from Assam to represent the East,” Subrata Ganguly, director of Church Art, toldThe Hindu. 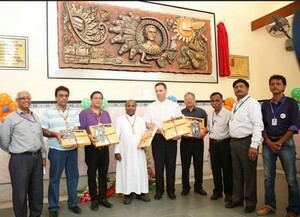 Liluah — The 10th successor of Don Bosco today unveiled and blessed a mural marking the closing of the bicentennial celebrations of Don Bosco’s birth at the three day South Asia Salesian Family Congress being held at Don Bosco School Liluah since yesterday, 26th September. The bicentenary mural on the façade of Don Bosco School Liluah Auditorium is a tribute to the father and friend of youth Don Bosco by a Don Bosco School Liluah alumnus. Kolkata based Churchart works are on display at the International Nativity Museum at Bethlehem, and at Don Bosco Anthropological Museum in Shillong. “It is my labour of love and I am privileged to do it for my alma mater,” says Mr Subrato Ganguly, CEO of the internationally renowned Kolkata based Churchart. The 11 ft by 6 ft mural depicts, in typical Indian motif, has Don Bosco as the radiant Sun – the universal source of light and energy. Just as Lord Surya (the Sun God) rides in his seven-horse chariot spreading light, Don Bosco too has edified the youth dispelling the darkness of ignorance, hunger and sorrow. Don Bosco the educator in the mural personifies wisdom (swans), knowledge (the quill) and joy (musical instruments). The fern leaves in the mural depict evolving life and civilization, the folded palms and flowers portray devotion and dedication, and the locomotive is a reminder of the association of Don Bosco, Liluah with the Indian Railways. A mural is any piece of artwork painted or applied directly on a wall, ceiling or other large permanent surface. The first murals known to mankind goes back to 30,000 BC. There are many different styles and techniqes and perhaps the best known is fresco. The use of fibre glass murals, like the one presented here, is a relatively new concept in the modern world. Kolkata to celebrate Mother's Teresa's canonisation with film fest. 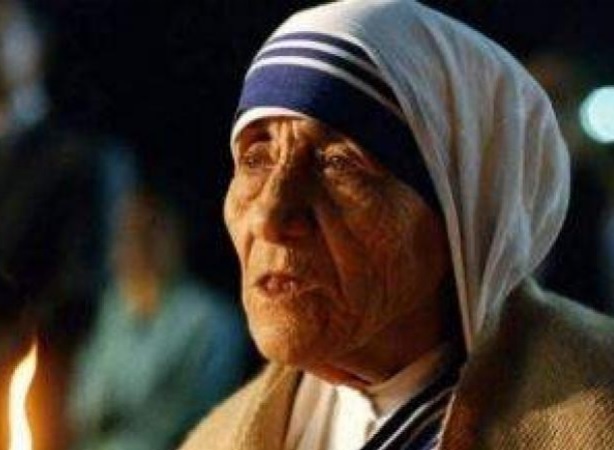 Kolkata, Aug 19 (IANS) A film festival screening the biggest repertoire of films and documentaries on Mother Teresa, a Thanksgiving Eucharist and a homage by the Mamata Banerjee government are among a series of events planned in the city to celebrate her historic canonisation. The four-day Mother Teresa International Film Festival (MTIFF), beginning August 26, will feature 23 foreign and Indian films made on or inspired by the Nobel laureate and includes three world premieres and an India premiere. To be held at the state government-run auditorium Nandan, the fest opener is an American documentary "Mother Teresa". Besides seven Indian films, entries from USA, France, UK, Spain, Italy, Canada and Japan will be screened. On October 2, a "Thanksgiving Holy Eucharist" followed by a civic programme will be held at the Netaji Indoor Stadium where among others, Vice President Hamid Ansari will be present. The celebrations will culminate November 4 with the state government organising a "Homage to St. Teresa of Calcutta" where Chief Minister Mamata Banerjee will be present. The series of events beginning August 21 include quizzes, talk shows, symposium, and an art exhibition. A life-size bronze statue of Mother Teresa would also be installed at the Bishop house in the city. Mother Teresa will be canonised by Pope Francis at the Vatican on Sept 4. A life-size bronze statue of Mother Teresa would be installed at the residence of the Calcutta archbishop on Aug 25, the eve of Mother Teresa’s 106th birth anniversary. This was announced by Archbishop Thomas D’Souza of Calcutta at a press meet at the Archbishop’s House in Kolkata on August 19. The Teresa statue will be installed next to a statue of Saint John Paul II. The statue has been donated by Namit Bajoria, who is the Designate Honorary Consul of the Republic of Macedonia in Kolkata. Bajoria is also engaged in various philanthropic activities. The statue would be installed by Church Art – a Kolkata-based firm engaged in making various work of art for the church, schools and museums. With less than two weeks left for canonisation of Mother Teresa on September 4, the city where she served the poor and the destitute for nearly five decades has a series of events lined to commemorate the occasion. Archbishop Thomas D'Souza said a life-sized bronze statue of the Mother will be installed at the Bishop House next to the statue of Pope John Paul II. He added that the statue, donated by Namit Bajoria, the Designate Honorary Consul of Republic of Macedonia in Kolkata, will be installed at a programme on August 25. The events celebrating the canonisation of Mother Teresa which includes book releases, talks, symposiums, film festivals and an art exhibition, began on Sunday, with a programme at Santi Dan, Mother’s home for the homeless. The celebrations will continue in the city till November. On October 2, a ‘Thanksgiving Holy Eucharist’ followed by a civic programme will be held at the Netaji Indoor Stadium with Vice President Hamid Ansari among the guests. The celebrations will continue till November, with the West Bengal government planning a ‘Homage to St. Teresa of Calcutta’. Among the books to be released is Mother Teresa — A Life, written by the late Sudeb Roy Chowdhury, a well-known journalist. It will be released by two different international publishers in French and English. Another book by a Kolkata-based entrepreneur is expected to be released in Rome by Chief Minister Mamata Banerjee, who will be attending the ceremony in Rome. One of the highlights of the celebrations will be the Mother Teresa International Film Festival (MTIFF), beginning on August 26. The film festival will feature 23 foreign and Indian films made on or inspired by the Nobel laureate. Besides seven Indian films, documentaries and short films from the U.S., France, U.K., Spain, Italy, Canada and Japan will be screened including a film by Gautam Lewis, a 39-year-old film maker. As a polio affected child, Mr Lewis was rescued by Mother Teresa and later adopted by a British couple. The film maker will be in the city to attend the festival. Not only in Kolkata, but Mother’s country of birth, Macedonia, will mark the Sainthood conferment with many events. Born of Albanian parents in Macedonia in 1910, Mother Teresa came to India in 1929. She set up the Missionaries of Charity in 1950 and dedicated her entire life to the service of the poor and the destitute living in slums and streets of Kolkata. She was awarded the Nobel Prize for Peace in 1979. She died on September 5, 1997. Mother Teresa was beatified in 2003, by the Late Pope John Paul after a miracle of curing a woman hailing from Uttar Dinajpur district of a tumour in her stomach, which was later approved by the Vatican. 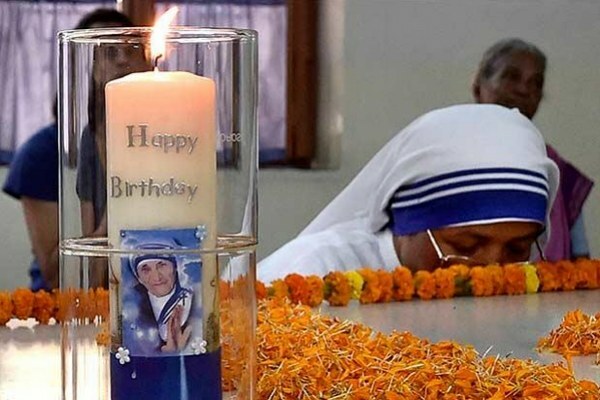 She became ‘Blessed Teresa of Calcutta’, one miracle away from being declared a Saint. Kolkata, Aug 19 : Archbishop Thomas D'Souza announced on Friday at the press meet that a life-size bronze statue of Mother Teresa would be installed at the Bishop house next to where the statue of Pope John Paul II currently stands. The Archbishop announced that the statue would be installed at a special function on Aug 25 - the eve of Mother Teresas birthday. The statue has been donated by Mr Namit Bajoria who is the Designate Honorary Consul of Republic of Macedonia in Kolkata who is also engaged in various philanthropic activities. The statue would be installed by Church Art - a Kolkata-based firm engaged in making various work of art for the church, schools and museums. Mother Teresa was born 1910 in Skopje the capital city of the Republic of Macedonia where the government earlier this month announced that Macedonia will mark the declaration of Mother Teresa a saint with several events and manifestations. A film festival screening the biggest repertoire of films and documentaries on Mother Teresa, a Thanksgiving Eucharist and a homage by the Mamata Banerjee government are among a series of events planned in the city to celebrate her historic canonisation. Kolkta to celebrate Mother Teresa canonisation. Kolkata: A life-size bronze statue of Mother Teresa would be installed at the residence of the Calcutta archbishop on Aug 25, the eve of Mother Teresa’s 106th birth anniversary. This was announced by Archbishop Thomas D’Souza of Calcutta at a press meet at the Archbishop’s House in Kolkata on August 19. The Teresa statue will be installed next to a statue of Saint John Paul II. The statue has been donated by Namit Bajoria, who is the Designate Honorary Consul of the Republic of Macedonia in Kolkata. Bajoria is also engaged in various philanthropic activities. A film festival screening the biggest repertoire of films and documentaries on Mother Teresa, a Thanksgiving Eucharist and a homage by the Mamata Banerjee government are among a series of events planned in the city to celebrate her historic canonisation. The four-day Mother Teresa International Film Festival (MTIFF), beginning August 26, will feature 23 foreign and Indian films made on or inspired by the Nobel laureate and includes three world premieres and an India premiere. To be held at the state government-run auditorium Nandan, the fest opener is an American documentary “Mother Teresa”. Besides seven Indian films, entries from USA, France, UK, Spain, Italy, Canada and Japan will be screened. Mother Teresa was born on August 16, 1910, in Skopje the capital city of the Republic of Macedonia. The Macedonian government announced earlier this month that the Balkan nation will mark the Mother Teresa canonization with several events and manifestations. Mother Teresa born on 26 August 1910also known as Blessed Teresa of Calcutta was an Albanian Roman Catholic nun and missionary. She was born in Skopje (modern Republic of Macedonia), then part of the Kosovo Vilayet in the Ottoman Empire. After having lived in Macedonia for eighteen years, she moved to Ireland and then to India, where she lived for most of her life. Mother Teresa founded the Missionaries of Charity, a Roman Catholic religious congregation, which in 2012 consisted of over 4,500 sisters and was active in 133 countries. They run hospices and homes for people with HIV/AIDS, leprosy and tuberculosis; soup kitchens; dispensaries and mobile clinics; children’s and family counselling programmes; orphanages; and schools. Members must adhere to the vows of chastity, poverty, and obedience, as well as a fourth vow, to give “wholehearted free service to the poorest of the poor”. Mother Teresa was the recipient of numerous honours, including the 1979 Nobel Peace Prize. On 19 October 2003, she was beatified as “Blessed Teresa of Calcutta”. A second miracle was credited to her intercession by Pope Francis, in December 2015, paving the way for her to be recognised as a saint by the Roman Catholic Church. Her canonisation is scheduled for 4 September 2016. A controversial figure both during her life and after her death, Mother Teresa was widely admired by many for her charitable works. She was both praised and criticised for her anti-abortion views. Her authorised biography was written by Indian civil servant Navin Chawla and published in 1992. Kolkata, Aug 19 (IBNS): Archbishop Thomas D'Souza announced on Friday at the press meet that a life-size bronze statue of Mother Teresa would be installed at the Bishop house next to where the statue of Pope John Paul II currently stands. The Archbishop announced that the statue would be installed at a special function on Aug 25 - the eve of Mother Teresa's birthday. 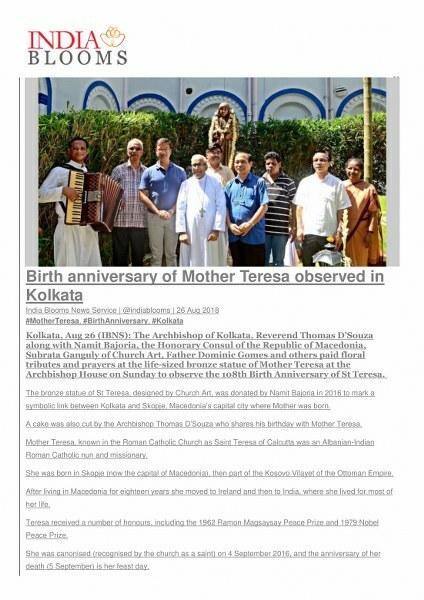 Mother Teresas statue to be installed in Kolkata..
A film festival screening the biggest repertoire of films and documentaries on Mother Teresa, a Thanksgiving Eucharist and a homage by the Mamata Banerjeegovernment are among a series of events planned in the city to celebrate her historic canonisation. The four-day Mother Teresa International Film Festival(MTIFF), beginning August 26, will feature 23 foreign and Indian films made on or inspired by the Nobel laureate and includes three world premieres and an India premiere. New Delhi: An international organization that promotes environmental sanitation will on September 17 honor a 104-year-old village woman who has become an epitome of Clean India Campaign. Kunwar Bai hit headlines earlier this year when she sold her goats to construct a toilet in Kotabharri, a remote village in Dhamtari district of the Chhattisgarh, a central Indian state. The centenarian woman’s gesture inspired residents of neighboring villages to build toilets at home. Her efforts have played a prominent role in making around 75 percent villages in the district free of open defecation. Her initiative led to declaration of two development blocks, Chhuriya and Ambagarh Chowki in Rajnandgaon district, as open defecation free. On Saturday, she received 200,000 rupees and a citation from Sulabh (accessible) International, an India-based social service organization. It was founded by Bindeshwar Pathak from Bihar in 1970. Making India open defecation free is one of the aims of the national campaign that covers 4,041 statutory cities and towns, to clean streets, roads and infrastructure of the country. It is India’s biggest ever cleanliness drive and 3 million government employees and school and college students of India participated in this event. Her son as well as the village chief of Kotabharri Kunwar Bai will accompanied to New Delhi. Although she lives far off from civilization, with no access to technology, newspapers or watches television, Kunwar Bai she came to know about the national cleanliness drive at a village council meeting. Forgetting her old age, she set out to fulfil the goal and sold off all her goats so to build toilets. She then encouraged other villagers to follow her example. She also started showing the toilets at her home to the villagers while informing them about its significance. The Sulabh International is all set to make her national epitome for Swachh Bharat Campaign. The NGO with 50,000 volunteers is the largest non-profit organization in India, claims Wikipedia.com. 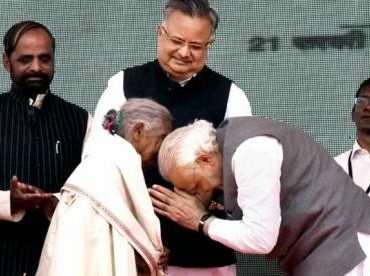 During his visit to Chhattisgarh in February, Prime Minister Narendra Modi surprised everyone by touching Kunwar Bai’s feet and praised her. He asserted that Indian could become clean if everyone followed the example of the elderly woman from a remote village. He hailed her as an inspiration for everyone, especially the youth. The sainthood conferred by Pope Francis on Mother Teresa of Calcutta on Sept. 4 here in the Vatican, was greeted with great enthusiasm and celebration across the globe, especially in India, but more specially in Kolkata, formerly Calcutta, the capital of eastern India’s West Bengal state, that the Albania-born nun adopted as her home town. Among the estimated 120,000 faithful and admirers of Mother Teresa from across the world who were proud to be the first-hand witnesses of the canonization ceremony here in St. Peter's Square was Mr. Subrata Ganguly, a businessman from Kolkata.Mother Teresa and Mr. Ganguly have much more in common than just being from the same city. From his surname, Mr. Ganguly is a Hindu Brahmin, a non-Christian, but he is no stranger to Christian art. Perhaps he is more versed in Christian art than most Christians. A mechanical engineer turned businessman, Mr. Ganguly is the owner and CEO of Church Art, a unit of Lokenath Engineering of Kolkata, engaged in designing and manufacturing a wide variety of art works for Christian churches, schools, institutions and museums all over India and also abroad. Ahead of the Sept. 4 canonization of Mother Teresa in the Vatican, Mr. Subrata Ganguly paid his special homage to Mother Teresa, immortalizing her in a life-size bronze statue that will endure the ravages of time for a very long time to come. Mr. Ganguly headed the designing, sculpting and finally installing the 1.6 meter tall statue weighing about 240 kilos in the Archbishop's House in Kolkata, next to the statue of St John Paul II. The figure cast in Bangkok, Thailand, was financed and donated by entrepreneur and philanthropist, Mr Namit Bajoria, another Hindu, who is the Designate Honorary Consul of the Republic of Macedonia in Kolkata. The Chief Minister of West Bengal state, Ms Mamata Banerjee unveiled the statue at a special function on August 26, on Mother Teresa's 106th birth anniversary. But there’s much more between Mother Teresa and Mr. Ganguly, as we come to know from this interview with him. New Delhi: Don Bosco Centre for Indigenous Cultures in Shillong has featured among the top 10 museums in India in a recent survey. 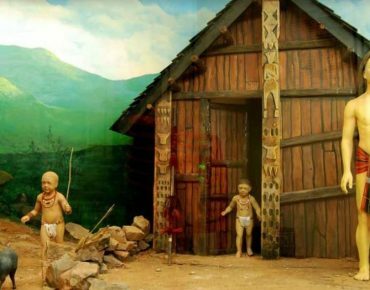 The museum situated in Mawlai near Shillong is aimed at preserving and promoting indigenous cultures in India as well as other parts of the world and is a favourite tourist spot. The centre also organises study and research on indigenous people in the North East. Established in 2001, the Don Bosco Museum of Indigenous Cultures at DBCIC (Don Bosco Centre for Indigenous Cultures) is Asia’s largest Museum of Indigenous Cultures of its kind. In it the visitor can have an overview of the whole of North East India. Rising into Shillong’s skyline the Museum is a seven storey building with 17 well laid out galleries containing artefacts, paintings, fibreglass figures brilliantly executed by Church Art Kolkata – a subsidiary of Lokenath Industries Kolkata. “I have travelled extensively in Europe and South America in 1990s with founder director of DBCIC Dr Sebastian Karotemprel to study anthropological as well as indigenous culture museums,” says Kolkata based Church Art Company CEO Mr Subrata Ganguly. Apart from its amazing galleries – all a feast to the eyes and a source of knowledge – Don Bosco Museum welcomes its visitors to have a breathtaking view of Shillong City from the Museum’s skywalk. “[The museum is] a fascinating and informative collection of cultural and historical treasure of North-East India,” says Go UNESCO heritage writer Gaurav Abnesh Kulshrestha. “The museum has a perfect blend of information with technology, with information screens, automatic lighting systems, etc. added to augment the experience of the visitors,” says DBCIC Director Dr Joseph Puthenpura. TripAdvisor will honour the ranked museums with its Travellers’ Choice awards. “The list was determined using an algorithm that took into account the quantity and quality of reviews and ratings for museums worldwide, gathered over a 12-month period,” it said. Bandel: The prior of the oldest Catholic church in eastern India has called people to forgive others and tolerate each other “as a practical way” to form a community of peace and harmony. “Whatever be our religion or culture, forgiveness, the hallmark of Good Friday, is the only path to co-existence and peaceful living,” says Father T L Francis, head priest of Marian shrine at Bandel in Hooghly district. The church was established by Portuguese missionaries in 1599 on the banks of Hooghly River, some 60 km northwest of Kolkata. The 63-year-old prior spoke to pilgrims to the shrine as the Church began the Holy Week when Christians commemorate events related the last days of Jesus Christ. The priest’s Good Friday and Easter messages came in the wake of attacks on Christians and Muslims in the name religion spreading across the country. “Forgive others and tolerate each other,” he told the visitors, who seemed alarmed by growing intolerance and strident Hindu belligerence unfolding in various parts of the country. According to media reports, six states ruled by the Bharatiya Janata Party (BJP) have banned beef consumption and enforced cow protection laws with the help of vigilante groups that target Muslims. The Evangelical Fellowship of India, a Christian group based in New Delhi, has noted that Palm Sunday services on April 9 were disrupted and Christians at five places in Haryana, Madhya Pradesh, Rajasthan and Uttar Pradesh in the north and Tamil Nadu in the south. Recently in West Bengal, various affiliates of the Rashtriya Swayamsevak Sangh took out processions with swords and other lethal weapons on Ram Navami. Radicals chanted slogans in Hindi as they marched through the streets of Kolkata, Birbhum, Burdwan, Nadia, Malda, Midnapore and Darjeeling. A significant visual treat awaits visitors to the shrine on Good Friday, says Subrata Ganguly, head of the Church Art Kolkata. His firm has installed a 10 feet high and 7 feet wide mural of “Resurrected Christ” just on the left side of the isle near the altar of the Sacred Heart of Jesus. The mural, a unique piece of art executed in bronze finish is the only one installed in entire eastern India, Ganguly told. 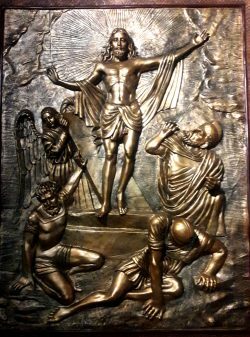 It is placed just above the statue of body of Christ laid out at 14th Station of the Cross. “The innocent man [Jesus] who was crucified by wicked people on Good Friday has triumphed over death and evil, by rising glorious on Easter Sunday giving us all hope beyond despair,” said Ganguly, a devout Hindu. 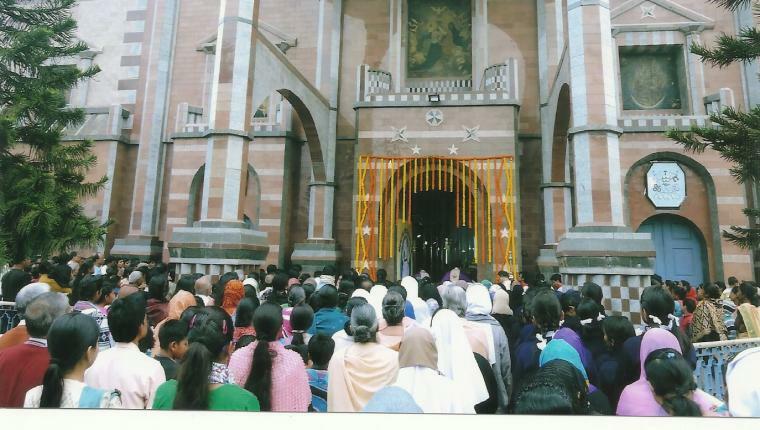 Ganguly’s earlier artistic installations in Bandel Church include bronze finish church doors in four places with liturgical symbols and figurines; open air Stations of the Cross which has 54 life size statues; a galaxy of popular saints’ life size statues as well as a musical fountain placed in the church ground in front of the shrine. As in the past, the Good Friday and Easter services at the Bandel Church will also be broadcast live on local cable television channel. “Whatever be our religion or culture, forgiveness, the hallmark of Good Friday, is the only path to co-existence and peaceful living,” says Father T L Francis, head priest of Marian shrine at Bandel in Hooghly district. The church was established by Portuguese missionaries in 1599 on the Hooghly River, some 60 km northwest of Kolkata. The 63-year-old prior spoke to pilgrims to the shrine as the Church began the Holy Week when Christians commemorate events related the last days of Jesus Christ. The priest’s Good Friday and Easter messages came in the wake of attacks on Christians and Muslims in the name religion spreading across the country. “Forgive others and tolerate each other,” he told the visitors, who seemed alarmed by growing intolerance and strident Hindu belligerence unfolding in various parts of the country. According to media reports, six states ruled by the Bharatiya Janata Party (BJP) have banned beef consumption and enforced cow protection laws with the help of vigilante groups that target Muslims. The prior also warned that no development was possible without peace. A significant visual treat awaits visitors to the shrine on Good Friday, says Subrata Ganguly, head of the Church Art Kolkata. His firm has installed a 10 feet high and 7 feet wide mural of “Resurrected Christ” just on the left side of the isle near the altar of the Sacred Heart of Jesus. The mural, a unique piece of art executed in bronze finish is the only one installed in entire eastern India, Ganguly told Matters India.